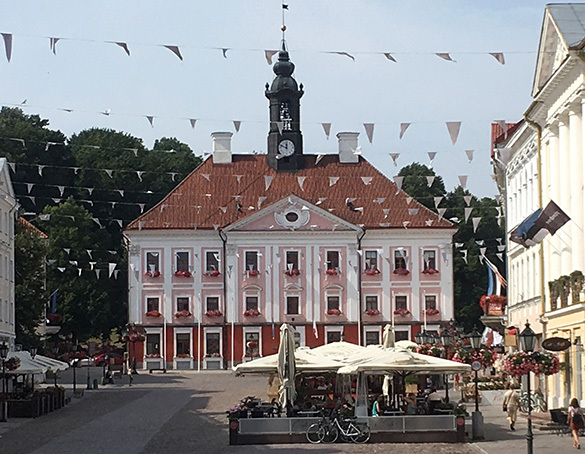 Tartu, Estonia– Bill Ausich and I arrived exhausted but safely in this old university city last evening. Fortunately we had this gorgeous Sunday to recover and adjust to the seven-hour time difference. We explored the neighborhood around our hotel (“V-Spa Hotell”). This is the city hall building. We had dinner under the umbrellas. It is hot here, with “extreme high temperature” warnings and forest fires to the north. 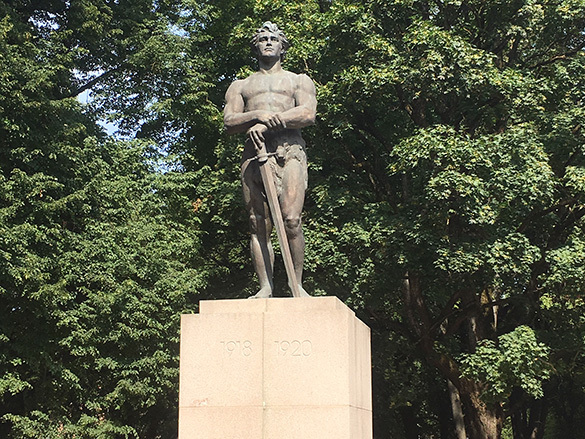 This statue memorializes the Estonian War of Independence from the Russian Empire (and soon to be Soviet Union) in 1918-1920. If you follow the link you’ll see how complicated these events were. This year Estonia is celebrating a century since it declared independence. Tragically, it has had less than fifty years of actual independence because of Soviet, then German, then Soviet successive occupations.